There I was trying to figure out which burr coffee grinder to buy. I was on Amazon, clicking through the options, I even had my Note application open. What was supposed to take e a few minutes turned embarrassingly longer as I became completely indecisive. I opened the browser wanting a decent black one and became overwhelmed with the many grind options, various designs, different capacities, significant price disparities (“You can pay that much for one – does it fly you down to Costa Rica and pick/roast the beans for you??”). This happens countless times during my online reading of news reports, blogs, ezines and various sites. It could be theological, political, cultural or trivial. Recently, the posts have been about racism, millennials, Isis, and those worthless time-waster pictures. For some reason, I must know if that picture was fake or not and for some other ridiculous reason, apparently I think if I just scroll down long enough, someone in the comment thread is going to have the silver bullet answer for me … and no one ever does. 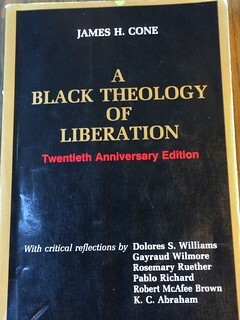 I was introduced to A Black Theology of Liberation by James Cone in one of my seminary classes at Biblical Theological. Since then, there have been a number of titles I keep referring to including Howard Thurman’s Jesus and the Disinherited and Justice For All and Let Justice Roll Down by John M. Perkins. But Cone was a bit more complicated (at least for me), and I remember thinking he needed more attention at a later point. That point came this past Christmas break where in the wake of Ferguson, New York, Cleveland and the killing of two NYC police officers. I’ve written on some of this already here and here but as I read blogs my black men and women, I kept feeling that I was missing something when it came to their references to black theology. And so reading Cone’s A Black Theology felt more than due. Here’s what I really appreciated. For a good while, I’ve felt conflicted about writing book reviews (described elsewhere), Cone brings up the same tension for me as the last thing I want to do is objectify. So instead of a review, here’s a bit of a reflection and an encouragement for those that can read Cone to consider adding him to their reading list. One of our Sunday morning class offerings is focusing on evil and suffering and the Christian story. The material is working from N.T. Wright’s Evil and the Justice of God. I appreciate Wright’s treatment on evil and God’s justice – highly recommend the book, and if you are local, check out the class. Here’s the link for more info. What I’ve really appreciated about the class is the opportunity for conversation. From the class leaders to the church at large, Im grateful that there is space to dialogue about evil, not just discuss apologetical rebuttals on evil. Both are important but both have limits. Praying, thinking, talking, learning, living helps move us forward in this world of suffering and hope. As I’ve been reflecting on the class, I’m struck that at any given moment, I can quickly create a list of grave atrocities. Charlie Hebdo, missing planes (again), the very brutal Boko Haram attacks (2000 civilian casualties in most recent wave of violence), all the conversations connected with Ferguson, and the personal things that only we know. It’s staggering to consider all the suffering that happens around us. Everything is a justice issue. I do not know an instance in life where justice is optional. There is brokenness in every system because each of us are flawed. There are real criminals. There are ill-intentioned people who will exploit and hurt you and your loved ones if given the opportunity. We cannot be naive to this. Similarly, there are also those who have been charged to protect, legislate, judge, and enforce our laws. They are needed and are value and we cannot be naive to this either. And because there is brokenness in every system and each of us are flawed, some will selfishly take advantage of any situation and some will fail to live up to their responsibilities. Justice is needed. Justice is needed but so are things like kindness, reconciliation, listening, communicating, forgiving, and peace-making. If life is about getting away with as much as you can get away (whether subtly or overtly), we will find not only is our life about seeking privilege, but that our hearts will become hardened by self-righteousness. And if life is about fighting every injustice, if we are not careful, we may bring an over-reaction, one that might be come from a different form of self-rightouesness, one that might be rooted in vengeance. Our souls are not designed for hedonism or to be the judge of all things. So what is life about and what are our souls designed for? These are among the questions that enter my mind as the weeks unfold from the killings and reactions of Michael Brown, Eric Garner and Tamir Rice. These questions were re-asked as I heard some protesters chanting “We want dead cops”, as I read the news of the killings of Brooklyn officers Wenjian Liu and Rafael Ramos and as I’ve observed the over-genarlized anti-police rhetoric that has been swelling. I am among those that want less violence, less inequality, less death, more respect, more unity, and more justice. Good society insists that we punish the guilty appropriately and good society demands that everyone is treated justly, without prejudice or discrimination. These are the basic human rights that people who hold to decency and honor are proud to champion. We are told that 27 police officers were killed while on duty in 2014 while other reports emphatically state the number is more than 5 times higher. I am not in a position to verify the statistics, but I mourn any loss of life. May God be with all of them and may the numbers decrease. Similarly, while no actual data can be agreed upon, the FBI estimates that about 400 people are killed by law enforcement annually and some say the actual number is much higher. It would be foolish to assume that the deaths of all of them could be avoided and it would be foolish to conclude that all of the deaths were justifiable. Again, we mourn the loss of life and we must seek ways to reduce the hurt. There are the numbers and there are the stories. As desensitized as I might be to violence, I am horrified when I watch the Tamir Rice video and I barely have the words to describe my reactions. The sight of the police car racing up to the playground and Officer Loehmann instantly shooting the twelve year old is shocking to say the least. Similarly, I am baffled and angered that Ismaaiyl Brinsley would drive up to New York City from Baltimore with the sole intent of killing police officers. Mentally ill or not, he had a plan, and had the whereabouts to update his Instagram account, this is evil. In Ohio, Cleveland PD has suspended and have distanced themselves from Officer Loehmann and I have heard no one defend Brinsley. My point is whether we appreciate the side of the protesters or of the police, we all must mourn and love the fallen of the “other side” and all sides, because for justice-seekers, it’s not “us versus them,” but rather a discernment of what is just, what is unjust, and then pursue what should be done. In the Bible, there is this metaphor of the wolf laying down with the lamb. It’s a scene where Isaiah describes a world filled with peace and the complete removal of fear. I wonder if we live in a world where a line of police officers could join protesters in saying “Black Lives Matter.” It’s not about protesting against themselves but rather protesting the brokenness of the heart and a call to fix the cracks in the system. Similarly, what would it look like if protestors would mourn our fallen officers? Can protestors hold up signs that say “Black Lives Matter” and “So Do Police”? And what does it look for all of us on both sides and in between to seek peace-making and do our part in confronting the instances of racism against minorities and unjust attacks against figures of civil authority? I believe these messages are needed. It’s been clear that so many on all sides are hurting, and have felt attacked. Thus, justice and healing are needed for all. But when everything becomes a fraternity and when we find ourselves more loyal to our system, tribe or people group rather than the universal values of goodness, love and life for everyone then we will be bound to repeat similar episodes of violence, loss and subsequent confrontation. But if we can love our neighbor and our enemy, if we can confront our prejudices, bring reform to our respective tribes, enter into pathways that lead to forgiveness and seek justice collectively, I believe we can lessen our societal division, pursue greater unity and experience healing together. This is among my prayers for 2015, I hope we can continue talking about such dire matters, and may we rely on the Lord to give us the courage and strength to bring peace. I was pretty sure I was not going to write a New Year’s post but I just couldn’t help myself. To create a resolution or not too, that is one of the questions. The others include: If I did make resolutions, what would they be? Would I be any more successful than last time? What happens if I don’t make any resolutions? Does anything really change and what is it that really makes the difference? We often hear making resolutions is not a helpful thing to do as most dissolve within a few weeks of the new year and there is always a well-written article written on how the failure to keep a resolution is worse than creating it. But in the big picture, I find the concept of resolutions to be a good thing. I’m not talking about the trivial resolution where we aspire to be instantly successful on every single one of our life’s ambitions. The resolutions that work are those that begin my taking inventory of life, exploring what needs to change and mature mature, and counts the cost of what needs to be sacrificed. Creating a plan, seeking accountability, celebrating the victories, and picking yourself up after the failures is part of what leads to better things. There is great truth in the maxim “failure is a great teacher.” The internet tells me the quote was made famous by Steve Harvey (but I suspect that it’s been around for a while). In any case, its obvious meaning points us to the learning opportunities presented in failure. Not only is there learning in failure but there is the potential for great motivation in failure. Without the sting of it, we might find ourselves content with our doldrums, lulls and sentiments of apathy.